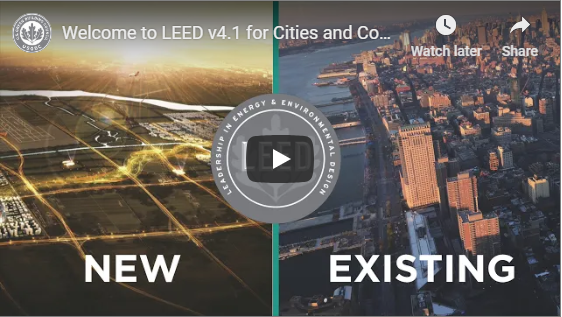 The U.S. Green Building Council’s new version of the LEED green building program – LEED v4.1 – is now available for cities, communities and homes. LEED v4.1 certification recognizes leadership by emphasizing performance monitoring, fully integrated design, social equity and human health factors. For the LEED for Cities and LEED for Communities rating systems, LEED v4.1 expands on the earlier performance-based approach to deliver a comprehensive framework to support plan, design, operation and performance management phases of both new and existing cities and communities. The rating systems align with all the UN Sustainable Development Goals and incorporate leadership standards and best practices from complementary systems, like the previously integrated STAR Community Rating System, as well as the PEER, TRUE, EDGE and SITES programs. More than 90 cities and communities around the world, representing more than 1 billion people, are LEED-certified based on several factors, including water efficiency, energy, greenhouse gas emissions, materials and resources, quality of life, innovation and regional priorities.